It’s impossible to celebrate independence of oneself. It is possible to take leave of your senses. День России, Russia Day, for which Russians take off today, is one of those cynical inventions for which Boris Yeltsin was responsible. It was on June 12, 1990, when, manipulating his control of the Russian republic parliament, Yeltsin declared Russia’s sovereignty from the Soviet Union, i.e, the start of his destruction of Mikhail Gorbachev, and almost everything else. A triumph of meretriciousness over sanctimony. In time, the insecurity from which the one seemed to be offering liberation from the other will deserve a different quality of relief – and apter memorial. So let’s celebrate instead the qualities of fight and love for an adopted homeland which an Englishman took to the grave on Friday evening. Patrick Leigh Fermor (right image 1942), dead at 96, is celebrated for a life of adventures, five years of fighting the Germans, and his love of Greece. That last has already been honoured by the Greeks. But greater than his own tales of the Peloponnese, on the Greek mainland, where Leigh Fermor lived until last week, is his rescue in English translation of a book he didn’t write. Called The Cretan Runner, in later editions it has been inappropriately subtitled “His Story of the German Occupation”. 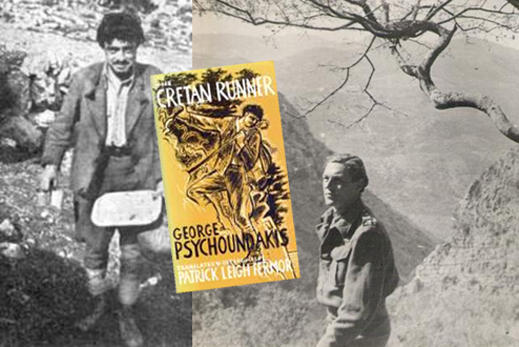 The author, George Psychoundakis (left image, 1942), died five years ago, his retirement subsidized by a job as caretaker at the German military cemetery at Malleme, on the northwestern shore of Crete. Not enough Germans are buried there. The symbol of their airborne invasion of Crete on May 20, 1941, which stands at the gate of the cemetery – an eagle clutching a ball in its claws – should have been removed years ago. The Cretan fight which followed was the first mass civilian resistance against the Germans in Europe. The Soviet resistance was to follow a few weeks later. Leigh Fermor was one of several Greek-speaking British spetznaz ordered to coordinate the Cretan fight after allied troops retreated from the German advance and evacuated the island. Psychoundakis was a young shepherd, who served as a courier of arms, money, radio parts, and information between partisan groups hiding in the White Mountains and around Souda Bay. His running is the narrative of the tale. His head was full of fight; his lungs and legs full of endurance. But his story, first translated and published in 1957, is a paean to the land of Crete — the passion it draws from those who defend it, the cowardice it exposes in those who try to conquer it. As Leigh Fermor acknowledged, at the war’s end in 1945 the Germans surrendered to the British, fearing they would never leave the island alive, if they surrendered to Psychoundakis and his countrymen. It is another story again why the coward who is the prime minister of Greece at the moment thinks he can surrender more of the patrimony to the Germans than the humblest Cretan has ever allowed. So, for today’s celebration, sing along with Antonio Lotti, the also-forgotten Venetian, first the requiem for what is being taken from us today, and then the credo for what survives in us, if we exercise our memory, and keep running.